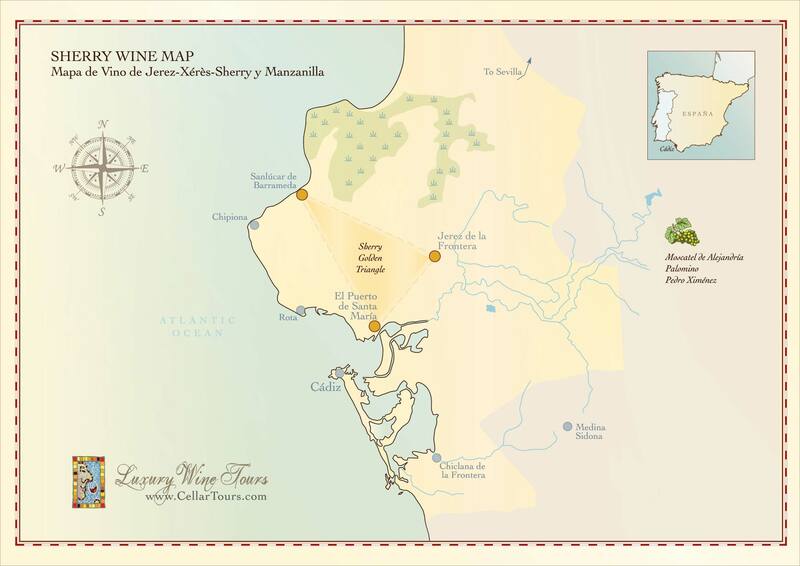 The Sherry wine country is a classic European wine region that absolutely merits a visit. The history of the area is fascinating and the beauty of the cellars, many referred to as “wine cathedrals,” is unsurpassed in Spain. And for foodies, the seafood in this romantic corner of southwest Andalucía is fantastic, from authentic and rustic grilled fresh fish served at the beach “chiringuitos” to the Michelin starred creations at Ángel Leon’s gastro temple “Aponiente” in El Puerto de Santa Maria. The Sherry Triangle refers to the three main wine towns of Jerez de la Frontera (where most of the historic cellars are located), seaside El Puerto de Santa Maria and charming Sanlucar de Barrameda (don’t miss Casa Bigote here! ), known for its beach horse racing. The wines made here are made from the Palomino grape, Pedro Ximénez and Moscatel and include styles like Fino, Manzanilla, Palo Cortado, Oloroso, Amontillado and more. Embed Sherry Wine Region Map on your site: copy and paste the code below.